Vitex, or chaste tree, is a small shrub with lance shaped leaves and purple flowers that are native to the eastern Mediterranean and easily grown in warm climates around the world. Its peppery fruit has been used for over two thousands years. This is a Highest Strength Alcohol-based liquid extract. You can also purchase an ALCOHOL-FREE version of this extract by following this link: http://www.amazon.com/gp/product/B01BKRSURG/ (Copy and Paste the Link into a Browser Address Bar). Vitex tincture contains ONLY natural ingredients! High Quality Vitex liquid extract - crude extract of first extraction! We meticulously produce our extracts according to precise standards where each herb is extracted according to the distinct characteristic of each plant! Super concentrated Vitex extract: dry material / menstruum ratio 1:3! We strictly use only organic or ethically sourced wild harvested material, organic alcohol, vegetable glycerin and crystal clear water! 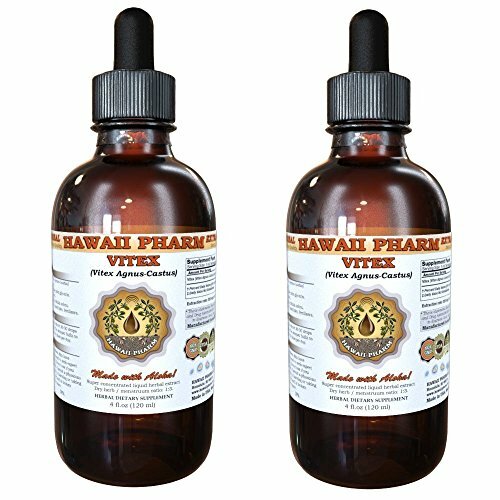 Really the BEST Vitex extract on market! Made with love for plants and respect for Nature! If you have any questions about this product by HawaiiPharm, contact us by completing and submitting the form below. If you are looking for a specif part number, please include it with your message.